Chanel’s Lucia Pica has unveiled her vision for summer with a mysterious yet audacious glamour – suggesting more than showing – by playing with colours and light layers. 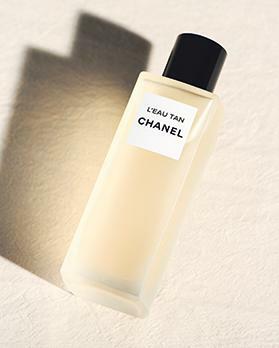 The Éclat et Transparence de Chanel collection is inspired by the puzzling and crystalline reflections of water, the illusive afterglow of sun-kissed skin and the intriguing voluptuousness of transparent organza voile. Through the enigmatic sensuality of shadow, light and sheer effects Pica presents her collection with the very lightest touch: an airy vision of beauty that blends just-warmed skin, bronzed by the sun’s first few golden rays, with soft, sheer, transparent colour. Milky pink, gentle aqua, gold and bronze are combined to create the perfect palette of dream-like summer hues, each inspired by the textures of summer: warm air, rippling water, hazy light filtering through a window. The softness of feathers and the sheerness of silk. It is about what lies beneath: the skin, warmed to a subtle gold by the first touch of sun, beautifully highlighted with plays of light. A study of what is seen and not seen; summer skin in all its bare, glowing beauty, layered with gossamer colour that gives a suggestion rather than a statement of colour. “It’s really about the application,” says Pica of her brand new vision of summer beauty, “and how to transform that glamorous feeling of summer into something that is still striking, but feels more transparent; more as if it really becomes a part of the skin”. Freely applied in delicate layers or harmoniously distributed, the gold and bronze light reflecting hues of the Palette Essentielle Ete enhance and accent skin with a magnetic summer glow, while the intense red blush awakens the face with a sophisticated touch. L’Eau Tan progressively deepens the beauty of suntan, leaving a fresh and invigorating fragrance imagined by Olivier Polge, Chanel’s in-house perfumer, for the occasion. 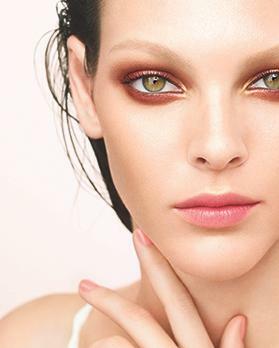 The quartet of eyeshadows Éclat Énigmatique, whose strong colours are subtly toned down once applied, illuminates the eyes with warm and slightly metallised tints, contrasting with the refreshing vibrations of Le Rouge Crayon de Couleur and the half-tone tenderness of Le Vernis shades.